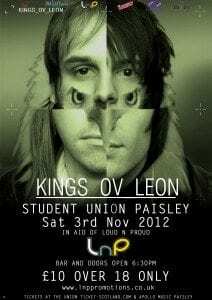 We have a fantastic chance for someone to win a Pair of tickets the LNP Promotions ‘Kings Ov leon’ Gig on Saturday 3rd November in The Union on Storie Street, Paisley. Notable venues include Tribfest – Europe’s biggest tribute festival, Marvellous Festival, a huge O2 Academy headline tour and the Ministry of Sound. The Kings Ov Leon carry a full professional PA system and lighting rig. Naturally all the guitars, drums, cymbals, amps and pedals are identical to their counterparts! How close can a tribute band get? The name says it all!